It was upon hearing students leaving the Globe Theatre on Monday 3rd December saying, “That was so inspirational, I now want to start a charity project” and the amount of students queuing at the end of the speech to obtain a business card that you realize how inspiring Peter Dalglish truly is. Not just any humanitarian worker, Peter Dalglish is the founder of Street Kids International and a leading authority on working children, street children and war-affected children. 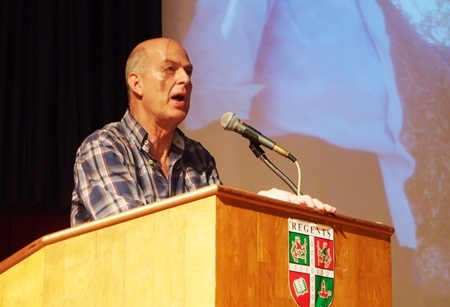 Peter joined us for an installment of Regent’s Presents called, “How to get your child into Stanford: It’s about more than just grades and test scores.” He stressed that personal development goes hand in hand with grades when it comes to applying for university – sometimes, it could even be the deal breaker. As a graduate of Stanford University himself, he would know. The universally shared understanding of the importance of education has now become a double-edged sword in certain aspects as there are a growing number of students that share the same exceptional grades. What distinguishes two university candidates that have the same grade level? Perhaps the one that helped in a project in Nepal working with children, or the one who initiated a scheme that taught children in Afghanistan to skateboard, Mr. Dalglish explained. Students that can share stories similar to these in their application show true maturity and set themselves apart from so many others; and its initiative like this that universities now really look for. 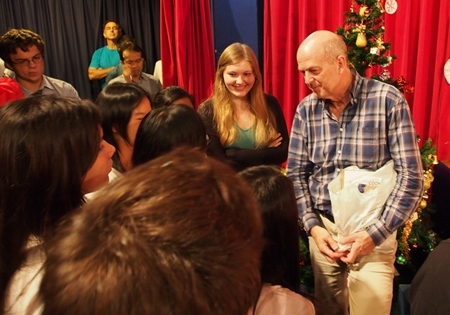 Peter Dalglish meets with students after his presentation. Mr. Dalglish left the students feeling empowered as he emphasized what they can do to help and the number of volunteer opportunities that exist for them that can help them change the world. He shared his experiences growing up without making it seem unattainable. Quite the opposite; he encouraged all students to do the same, leaving them with the feeling that they all have the potential and duty to help others. For more information please visit www.streetkids.org or contact Mr Paul Crouch on [email protected] for ways to get in touch with Peter Dalglish. The opportunity to be a part of a project could change a person’s life.